It’s 20 years since we were introduced to Volvo’s first iteration of the Cross Country, and the new V90 version is the best one yet. It’s 20 years since we were introduced to Volvo’s first iteration of the Cross Country on the V70 platform. Since then, the variant has proved to be a huge hit for the Swedish brand, so it’s no surprise to see predictions that 25% of all V90s are set to be ordered in Cross Country guise. Its identity is given away by a noticeably beefier suspension set-up, large 18in alloy wheels and a host of chunkier charcoal-coloured trim. 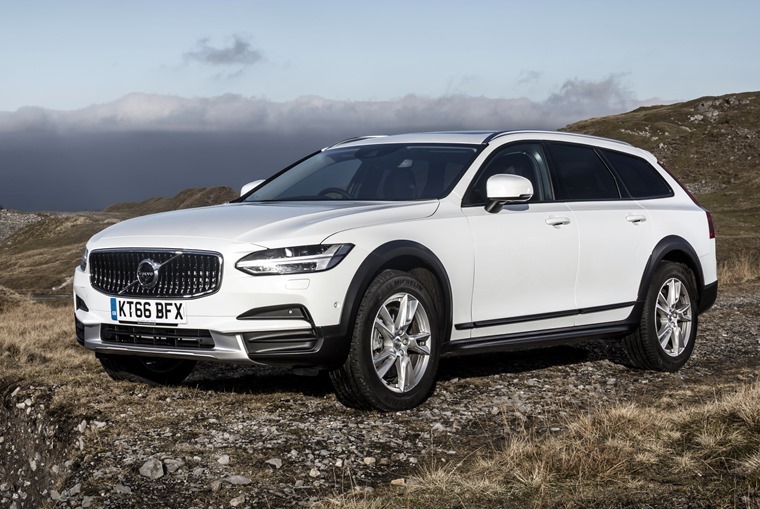 In some ways, the Cross Country is a half-way house between the sensible, stylish V90 Estate and the opulent upmarket XC90 SUV. Thanks to a 65mm increase in ride height, it makes most pot holes an irrelevant concern. That puts it squarely in the firing line of the Audi A6 Allroad, Mercedes’ upcoming E-Class All-Terrain and Volkswagen’s Passat Alltrack. While the vast majority of these cars’ drivers are ever likely to call their off-roading prowess into action, it’s always reassuring to know it’s there. On the road at least, the Cross Country is just as – if not more impressive – than a normal V90. Thanks to a 65mm increase in ride height, it makes most pot holes an irrelevant concern, and it’s certainly a smoother ride than many similarly sized estates can muster; without doubt, this is a car that prioritises comfort. As you’d expect from a car that tries to make the drive as relaxed as possible, steering input is effortless. It’s no layabout in the handling stakes though, thanks to its upgraded damper and suspension set-up that maintains a planted feel at all times – on and off road. A quick glance around the cockpit further confirms this is designed to be a comfortable car. 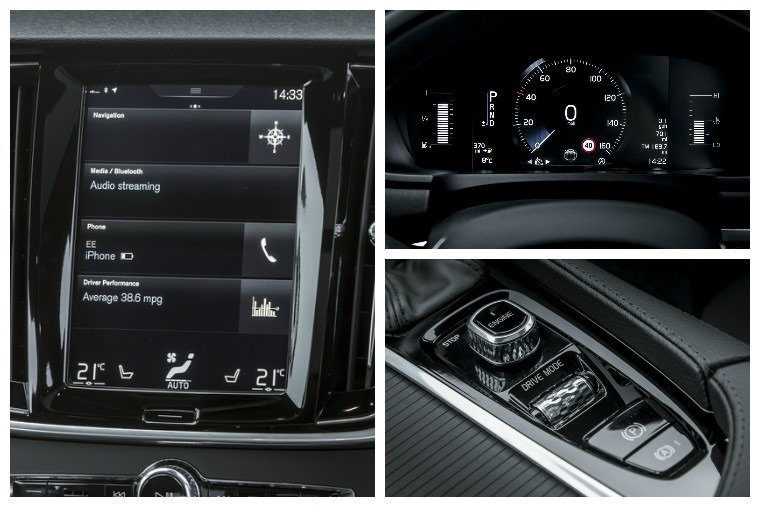 The minimalist dashboard is the centrepiece to Volvo’s “calm, relaxing interior” and is a marked departure from its V70 forbear’s one-piece floating control panel. The V90 is a large car, and that comes across by its sheer roominess; not just in the form of leg room and luggage capacity, but shoulder room too. This allows for a massive central armrest, forward of which you’ll find lots of cubby spaces and the stop/start controls. It might look a little plain, but that’s the point. Aside from a row of buttons for the radio, everything (including the off-road driving mode) can be controlled via a central 9in touchscreen. Like a BMW, the screen is angled slightly towards the driver. Like a BMW, the screen is angled slightly towards the driver. 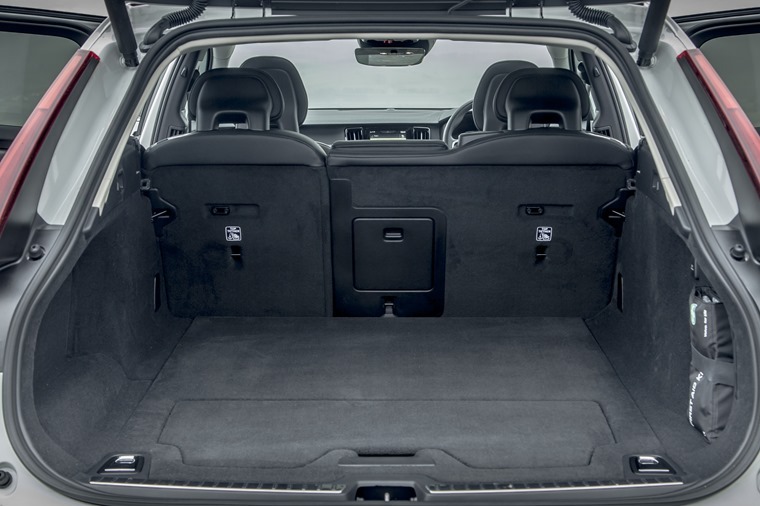 If you’ve had a Volvo estate in the past, no doubt you’ll be used to the acres of room in the rear quarters. For decades they have been the ubiquitous dog carrier of choice around the globe. 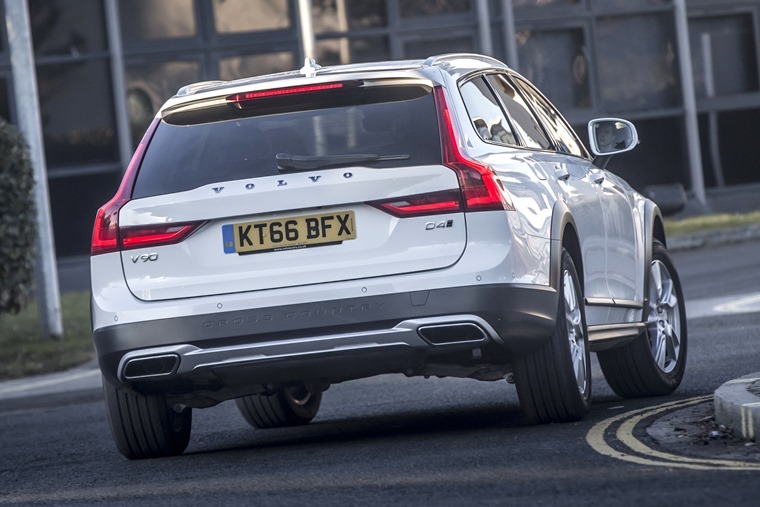 However, the V90 Cross Country offers just 560 litres with all the seats up. Ok, that’s still a lot of room. 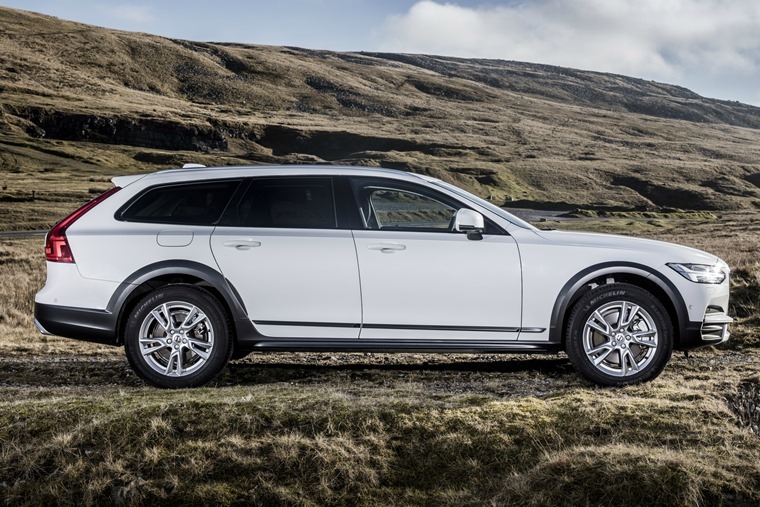 But it’s worth bearing in mind that once smaller rivals have seriously upped their game in recent years, with the E-Class Estate’s 760 litres seriously doing the once all-conquering capaciousness of a Volvo. However, one Volvo trait that remains as strong as ever with the Cross Country is safety. The Volvo S90 and V90 are just about the safest cars available today, no doubt in part thanks to to the autonomous emergency braking system, and of course the ever-advancing semi-autonomous driving aid that takes the dangers, and stresses, out of motorways. Volvo's S90 and V90 are just about the safest cars available today. The Cross Country is available with two diesel engines, and we tried both. The entry-level 2.0-litre D4 gets 188bhp and 400Nm of torque. It’s more than adequate for the car’s size, and gets a 0-62mph time of 8.5 seconds and is capable of 62.8mpg. It’s the 232bhp D5 that suits the Cross Country best however, and makes overtaking effortless. Not only just it get an extra 80Nm of torque, it features Volvo’s PowerPulse technology too, which helps eliminate turbo lag – great for towing and those occasional off-road jaunts. Whichever unit you go for, you’ll get an eight-speed automatic gearbox. It misses out on the paddles you’ll find on the likes of the E-Class, but you can manually control the gears via the stick, and it’s just as intuitive as a Mercedes transmission, too. But what about the minute percentile of Cross Country drivers that do live in the remote backwaters of Sweden? 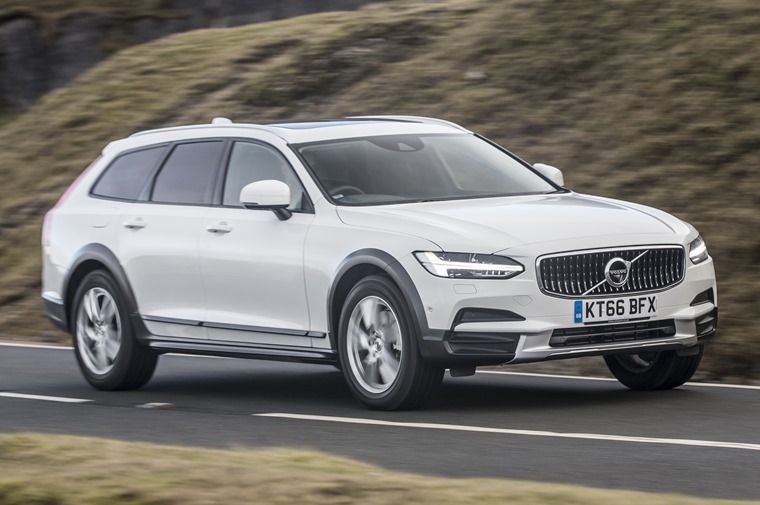 Volvo can already count a fully fledged SUV on its books with the XC90, so it’d be wrong to put this high-riding estate in the same class but, because it uses the same platform and 4X4 tech as the larger XC, the V90 really can cut it when the going gets tough. Slip the Cross Country into Off-Road Drive mode and below 25mph, it will maximise the car’s performance regardless of terrain or weather. There’s also the likes of Hill Descent Control on offer, while front and side cameras are there to help you out so you don’t accidentally pull the chunky trim over larger rocks. 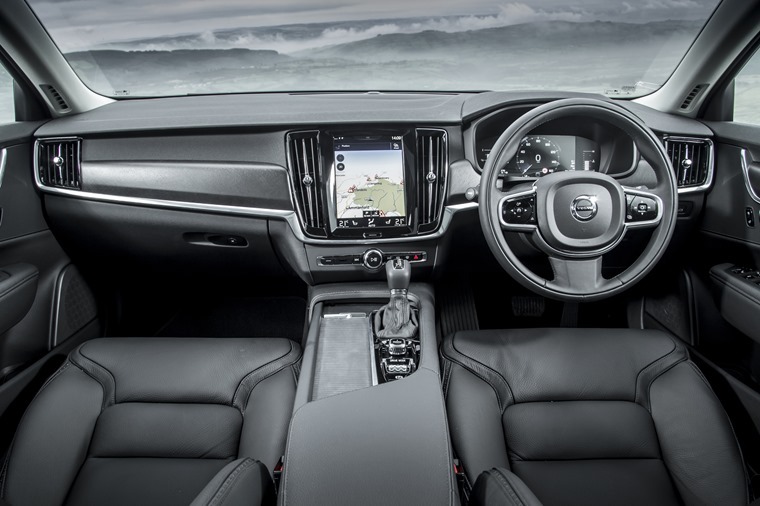 So aside from a rather pokey (by usual Volvo standards) boot, is there any downsides to the new Cross Country? Well, a liberal ticking of the options list is likely to increase monthly payments somewhat. This is a luxurious, upmarket vehicle that’s supremely well-built. The Xenium pack which includes a panoramic sunroof, parking camera and park assist pilot comes in at £2,000, while Air Suspension is a costly £1,500. That said, its starting price of £39,785 significantly undercuts the upcoming E-Class All-Terrain’s £45,000+ price tag. If you like your cars flash, it might not be the one for you. Be in no doubt however, that this is a luxurious, upmarket vehicle that’s supremely well-built. It’s just that it goes about it in a much more understated, Swedish manner than its German rivals.